In the beginning The Holiday Fellowship made the Glasgow group. In 1916 the third year of Holiday Fellowships existence , under the guidance of its founder ,Thomas Arthur Leonard,* The Holiday Fellowship Ltd established a holiday centre in Portpatrick in the south west of Scotland and provided the walking which HF was best able to offer, and it was not surprising that Glaswegians grasped the opportunity with both hands and feet . During the following winter of 1917 some 12 of the Portpatrick centre guests met at the home of Rev Henry Wallace** in Shettleston in the east end of Glasgow. They were mostly strangers to each other, but they had one thing in common, the experience of an HF holiday, this welded them into the power which later infused life into the Glasgow group. The Group was thus brought to life. The charm of that group at that time was its informality. Rambles were held regularly. When walks were not on , the time was spent over ham and eggs and a 'blether' round the fire of a wayside tea room. Other less happy folks were not forgotten , these were the war years and the boys at the military hospital at Bellahouston in Glasgow were not forgotten and had cause to know the Glasgow group. Walking in the 20's was a flourishing pastime , the tramcar was the magic carpet for the masses to the "Borderlands of Glasgow" - the title of the outline of tramps radiating from tram terminals. A muster of sixty odd ramblers on Saturdays and on Tuesday afternoons and evenings was by no means uncommon and according to the syllabus "song books should always be carried". Winter rambles always finished in a social evening , possibly at one of the tea rooms under the friendly ownership which the Group regularly patronised , or it might even have been a night at the pictures or the gods (theatre) . 1921 saw Tom Hall take control of the helm. The tempo of the activity quickened, and the following year found two lectures being delivered to other organisations . At St Andrews Halls the re union in 1923 housed around 123 friends. The Cobbler the popular name for Ben Arthur near Arrochar was added to the still intermittent rambles which actively remained quiet and serene till 1925 when things began to move . That familiar little object , the weekly programme made its debut in 1925. At the re union 80 friends joined the Group , while in May , Altachorvie HF Guest House at Lamlash was " house warmed" by the members . Rambles were held monthly , four being held jointly with our close friends the Health Culture Society, HF and the YMCA Ramblers respectively, but the most important feature of the year was the influx of the members with energy , initiative and a real desire for strenuous tramping. It was the 1930's that the Glasgow Group came through its adolescence to the vigour if strong youth. The previous happy go lucky and intinerant activity gave way to order and regular action while the stress and co-operation of effort created an enthusiasm of friendship among the members both individually and collectively . The membership reached 133. The Saturday Rambles were held weekly . A site was sought upon which was to rise the Group Camp ,(later to be known as Drumkinnon Camp) and in the New Year Day Tramp was to Earls Seat on The Campsie Fells just to the north west of the city. Growth and change were inevitable . The early Group may seem to have been dilettante to the strenuous trampers and climbers of the day . It may have lacked the urge for great experiment and development , but it laid the foundations of friendship ,comradeship and sympathy for others, upon which the present Group is built . From 1926 onward , so active and enterprising were the officers and members of the Group that to record their doing fully would over-tax the space available in this programme. The following outline may not be good reading but it will show the fluctuation fortunes of the Group and perhaps enable present and future members to consider the reason for the changes to the lasting benefit of all . Having created the Co-operative Holidays Association he founded The Holiday Fellowship and was our General Secretary until 1934. In the 1930's he helped create the Youth Hostels Association and was one of the founders of the Friends of the Lake District. He also chaired the first national meeting of the Ramblers Association in 1935. 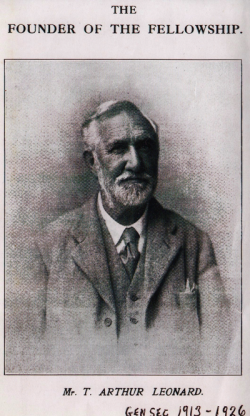 * Thomas Arthur Leonard is one of the key figures in the British outdoor movement, who helped create numerous organisations , including HF Holidays. 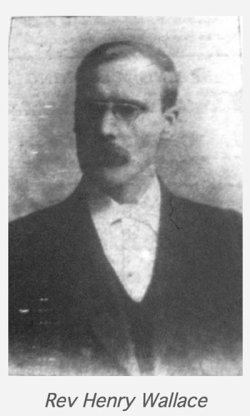 ** Rev Henry Wallace was Minister at Glasgow Parkhead Congregational Church from 1906 until 1937.